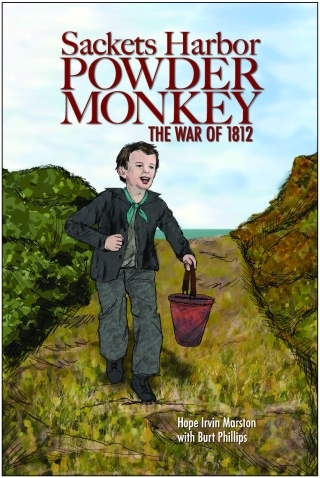 Sackets Harbor Powder Monkey: The War of 1812, by Hope Irvin Marston with Burt Phillips, was published in July 2012. The book is available as both a paperback and as an e-reader Kindle version from Amazon.com. It’s also available in e-reader NOOK version from www.barnesandnoble.com. "Ain't we ever gonna have a real fight?" Rankin muttered. It’s 1811 and eleven-year-old Rankin McMullin is ready for action. He has joined the warship Oneida to fight the British and end the laws that have forced New York farmers to become smugglers. As a powder boy on the brig, his job is to carry gunpowder to the carronades. When the shooting begins, the battle is seen through Rankin’s eyes. The unique way it is fought and the unusual way it ends surprises both sides. Rankin's story is the first book about the opening battle of the War of 1812 at Sackets Harbor. The persons named and the events portrayed are real. Social Studies teachers will find this book useful in sharing a bit of neglected history with their students. "I am in the sixth grade in a school for the gifted. English is my second language. This book was easy for me to read and understand. The story begins with a ten-year-old boy named Rankin sneaking out to see the warship "Oneida" docked at Sackets Harbor. The people in the village have been waiting for the ship to come. It will be looking for men to join the crew. When Rankin's pa gives his older son William permission to sign on, Rankin wants to go too. Will tells Rankin the only jobs for kids on a warship are for powder monkeys. Powder monkeys are young boys who can run fast up and down the ladders on the ship carrying gunpowder from down in the hold to the cannons on deck. It's a dangerous job because an enemy ship will try to kill the powder monkeys so the guns can't be fired. Rankin doesn't scare easily and he and his brother sign up together. His first job on board in unpleasant, but he is determined to do his best. Eventually the war begins and he gets to carry the powder to the long gun, but not in the way he expected. I spend my spare time playing games. After I started this book, I wanted to read on instead of going back to my games. Rankin and his big brother were brave characters. I hate war so I liked the surprise way the battle ended. This was a fun way to learn about the first battle in America's War of 1812." "The War of 1812 is not a "major league" war in US military history. Compared to the Civil War, the two World Wars, or the Korean/Viet Nam conflicts, it does not loom large as far as duration or number of casualties. In Hope Irvin Marston's recently published book, Sackets Harbor Powder Monkey, this often-overlooked war takes on a human dimension. The central character is eleven-year-old Rankin McMullin, a far cry from Andrew Jackson, the near-mythic hero of the War of 1812. The locale is the port town of Sackets Harbor, New York, tucked away in the eastern end of Lake Ontario. The strategic importance of this village is the presence of the US brig, Oneida, which aims to disrupt the trade of potash between the US and Canada. Even though this trade is illegal, it is necessary for the economic survival of the Sackets Harbor region. But economics is the fartherest thing from young Rankin's mind. His prime desire is to actually step on board the warship and then, if by some miracle!, to become a member of the crew. We sense the excitement as Rankin and his older brother are introduced to the ship, experiencing the revulsion of cleaning the bilges and learning what is involved in the duties of a "powder monkey." After months of training and familiarizing themselves with the workings of the ship, the long-awaited crisis comes to a head--war breaks out between Great Britain and the United States. The reader then follows the first battle at Sackets Harbor, this being the only book to deal with that one. (A second battle was fought the next year at Sackets Harbor.) Especially helpful is the inclusion of a list of obscure nautical terms and their definitions. Military history customarily looks at the "big picture," while this work offers a more personal, localized picture of war. To see warfare through the eyes of a pre-teen is an intriguing, yet realistic, perspective. Although war has changed considerably in the lasttwo hundred years, Ms. Marston's book presents a vivid compelling portrayal." "What eleven-year-old boy wouldn't love to live on a ship? Rankin McMullin gets the chance of a lifetime in this children's book about a battle during the War of 1812. Rankin's routine life in Sackets Harbor becomes much more exciting when he and his brother are recruited to become crewmates on the Oneida, a wind-powered warship sailing Lake Ontario which defends the United States. When British Canadian ships make a strike at Sackets Harbor and the Oneida, Rankin, his brother, and the whole town pitch in to repel the invaders. Marston's research is thorough and the included index will add to any young person's understanding of common ship terms and life aboard a sailing vessel." "Anchors aweigh. 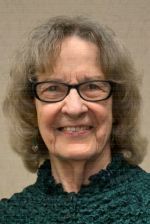 Hope Irvin Marston, the well-known author of more than thirty books for children, has written a historical novel for middle school students. Middle school is when kids study New York State history, and Hope is a retired North Country middle-school teacher and librarian. So she knows her stuff. From its appealing front cover design to the illustrated warship Oneida that sails across the back, this is a carefully researched tale. Based on the little-known first battle of Sackets Harbor, the book was written to coincide with that battle's bicentennial. Young readers will identify with 11-year-old Rankin McMullin, who longs to take part in a real fight. They will learn along with him about the workings of early sailing vessels, back in the days when Rankin and America's Navy were nearly equal in age. The persons and events in the book are real, but invented dialogue has been added to dramatize the action. The story is made more true-to-life by the inclusion of early nineteenth century nautical terms like "binnacle" and "carronade." A helpful glossary is provided; as well as an Afterword; a hand-drawn, commissioned map; a brief discussion of battle folklore; an annotated bibliography; and suggestions for further reading. The back matter is especially helpful and complete. This book will appeal to Social Studies teachers, history and genealogy buffs, battle re-enactors, and anyone who loves the Sackets Harbor region." "Not only is this a must-read for both kids and adults who love adventure stories, it is also a fascinating peek at the opening battle of the War of 1812. Told through the eyes of 11-year-old Rankin McMullin, a capable boy from Sackets Harbor, NY, the reader is taken on board the warship Oneida and experiences the day-to-day life of a young powder monkey. Hope Irvin Marston is a master at weaving historically accurate details into a gripping tale, which makes this book perfect for classroom read-a-louds. Highly recommended!" "Hope Marston brings a War of 1812 confrontation to life through the eyes of a boy with a personal motive for resisting the British. The reader is immersed in sights, sounds, and smells that confront a boy learning to prepare for battle on a warship, and is shown how he plays an important role in the fight. The book appears to be based on well researched fact, and the bibliography and glossary are informative resources. Don't be misled by the cover illustration of the character, who is described in the text as appearing "several years older" than twelve. Frequent changes in point of view may cause some initial confusion." "Very inspiring story for any child, on accomplishing your dreams! Rankin is a very brave and courageous young boy who accomplished his dream of becoming a successful powder monkey on the Oneida Warship. Teaches a child on being brave and going after your dreams. In addition, this story would be great for any military family. I loved the story!" "Ms. Marston created a hit once again with her book about the War of 1812. Sackets Harbor Powder Monkey is interesting, provides accurate information about Northern New York during this time in history and holds ones attention throughout the book. This book is appropriate reading for elementary students but is enjoyable for almost anyone. The 200th anniversary of the War of 1812 provides good motivation to learn more about this historical event. My husband and I both read this book and are now passing it on to our grandchild." "This book didn't feel like a history lesson to me but I sure did learn a lot. The author did a wonderful job of taking real life people and events and incorporating them into an interesting tale. I live in New York, and I didn't even know about this important battle in Sackets Harbor. She related life on a warship from the stinkin' bilges to the duties of many of the crew and that of a powder monkey. Each member had undoubted patriotism and extreme courage. I love that Hope saw a need out there and she met it head on. There are not adequate children's books covering this battle in a way that they can understand. Hope has included a lot of extras in the afterward too, including a glossary of words used. This book is ideal for learning in a traditional or homeschooling environment and in my opinion, it would be ideal for grades 2-6." "Hope Marston writes with precise attention to detail in everything from the ships, sailors and carronades of the period to the families inhabiting Sackets Harbor. It focuses on two youngsters who join up to experience life on an American warship. Its detail is comparable to Richard Henry Dana's "Two Years Before the Mast" written a couple of decades after the War of 1812. "Powder Monkey" is much shorter while obviously designed for a young teenage readership, it is informative reading for adults of all ages. All wars create bloodshed and loss of life, but the author skillfully skirts that along with any debate on why this useless war actually happened. The bottom line: A valuable and deftly created insight, a window on America 200 years ago. Congratulations Hope on your first self-published book. I know you will have continued success with this book and all the future stories you feel led to write." "This book didn't feel like a history lesson to me but I sure did learn a lot. The author did a wonderful job of taking real life people and events and incorporating them into an interesting tale. I live in New York, and I didn't even know about this important battle in Sackets Harbor. She related life on a warship from the stinkin' bilges to the duties of many of the crew and that of a powder monkey. Each member had undoubted patriotism and extreme courage. I love that Hope saw a need out there and she met it head on. There are not adequate children's books covering this battle in a way that they can understand. Hope has included a lot of extras in the afterward too, including a glossary of words used. This book is ideal for learning in a traditional or homeschooling environment and in my opinion, it would be ideal for grades 2-6. Congratulations Hope on your first self published book. I know you will have continued success with this book and all the future stories you feel led to write." "War of 1812 stories like this one bring history to life for today's readers. Inspiring our youth through tales of grit and courage promotes character building qualities needed in life's unpredictable journey." "This is excellent historical fiction, based on fact. Readers of any age can enjoy it. Ms. Marston has done her homework." 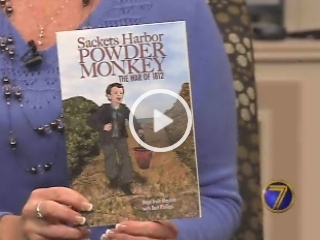 Hope Marston, author of 33 children's books, has proudly debuted her latest title, Sackets Harbor Powder Monkey--The War of 1812. In honor of the 200th anniversary, Hope has brought the war to life from the viewpoint of a young child, eager to help in the battle. You can purchase this book now by visiting Hope's e-store @ https://www.createspace.com/3836873. It is available at www.amazon.com and www.barnesandnoble.com."